The inauguration is over. Davos is behind us. Let’s start examining the impact of policy and politics as we move forward. The first three weeks has brought stasis for equity markets as the S&Ps have not set new highs since the December exuberance. Investors are beginning to comprehend that the slow-moving legislative process will impede Trump’s efforts for an expedited deregulation and tax reform program. But, if you follow the proliferation of stories about a possible dissolution of the EU, my prediction with Rick Santelli about Europe being the main focus of 2017 is coming to fruition. One wonders what was discussed in the backrooms of Davos that led so many global executives to suddenly express concerns about the increased populism in the Netherlands, France and even Germany. It seems that the Dutch elections have gained a prominent position as a severe test for Brussels-based eurocrats. In a January 20 Financial Times article, Martin Arnold reported from Davos, “Bankers Prepare For Eurozone Break-up Risk.” It seems that after being caught off guard by last years Brexit vote and the Trump victory, Global CEOs are careful about underestimating the anger of economically disenfranchised populace. As the FT article stated, “Other senior London-based bankers said they had been running scenarios to check their exposures to a potential exit in various countries since the Greek financial crisis erupted in 2012.” While this may be a fact, I would tell the London-based bankers that President Draghi has piled on so much debt to the ECB balance sheet that the global impact of these exposures would send the world financial system into a deflationary spiral. For Merkel, it is not her immigration policies that will foment the discontent but the rising discord from the financial repression laid upon the Bavarian Burghers by Mario Draghi and the ECB.The central bank’s policy made it into the Barron’s roundtable this weekend as Jeff Gundlach noted that his favorite trade for the year is SHORT GERMAN BUNDS. I am including a post from April 21, 2015, when I took Bill Gross to task for promoting the same trade. My argument with Gross–and now Gundlach–is not that the fundamental analysis flawed. It is that they fail to discuss the impact from the ECB’s policy, and, even more importantly the significance of the use of high-quality collateral as the backbone of the global financial system. The lack of high quality liquid assets makes the German debt very desirable as a mechanism of financing repo operations. The Germans are certainly struggling under the jackboot of President Draghi’s”whatever it takes” policy. But if you are worried about the continued existence of the EU entity then the Italian, Spanish, French and other debt instruments are potentially a far more lucrative short. Yes, German inflation is running hot, but that is more about the ECB and Brussels than it is about the Bundesbank. Yes, German growth is far outpacing the rest of the eurozone, thus the ECB’s interest rate is wrong for the German economy. This is going to be a political problem for Brussels as the German citizens are going to become disenchanted with receiving ultra-low interest rates on their savings in a high growth economy–the paradigm of financial repression. The French growth story is tepid at best and while French sovereign debt yields 27 basis points more than German bunds the slight differential is not worth the risk of France’s structural problems. 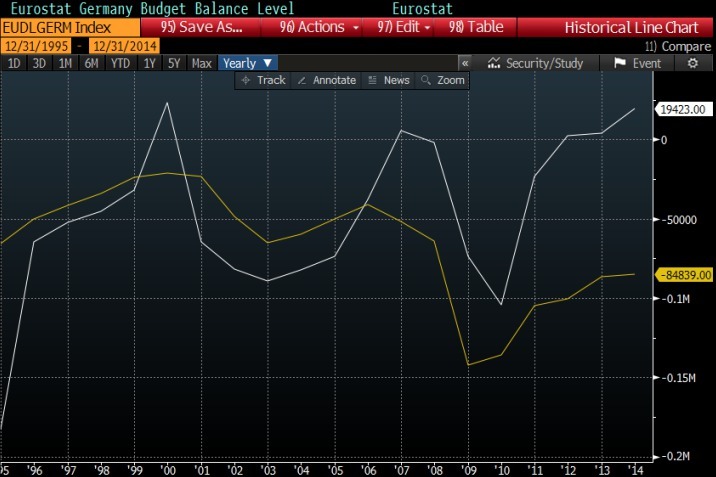 The following chart, courtesy of Bloomberg, will show the vast difference between the German and French budgets. Germany has a slight SURPLUS while FRANCE has a sizable deficit. The problem is further compounded for shorting the BUND rather than the OAT because the German debt is considered to be the highest form of collateral for operating in the European REPO MARKET and thus will continue to be in demand by the financial system. Also, because Germany maintains a massive trade surplus and France a significant deficit, the minimal spread between German and French yields renders the French 10-YEAR OAT the true short of a lifetime. Now, economic logic would dictate that the BUND should depreciate far more because of its GROWTH story but because the ECB has broken the European sovereign debt markets through its intervention all assigned values are meaningless. However, I will add a very important warning to those model builders of econometric risk. IF THE EUROZONE AND EURO WERE TO DISSOLVE, GERMAN YIELDS WOULD RISE IN RESPONSE TO THE REAL GERMAN ECONOMY. WITHOUT THE GOOD CREDIT OF THE BUNDESBANK, THE FRENCH AND OTHERS THEN WOULD BE SADDLED WITH THE THREAT OF SOLVENCY RISK AND RATES ACROSS THE EUROPEAN PERIPHERALS WOULD SOAR, INCLUDING FRANCE WITH ITS LARGE TWIN DEFICITS. For proof, look back to the financial markets in July 2012, before Draghi’s “whatever it takes” speech. The bottom line is Bill Gross is right. Debt levels are mispriced because of the ECB but it is the French oat that is the most egregiously overvalued. The problem for traders is that the ECB‘s 60 billion euro bond buying program has the ability to distort every bond market on any given day. If it runs out of bunds to buy, the ECB resorts to purchasing all the others. I hate to be cynical but the ECB sets the price of everything and the value of nothing. If the German people acquiesce to transferring large sums of money to support all the debt plagued European states then the German bund will be the greatest short of a lifetime, but the Bundestag providing the vast amount of funds will not be in our lifetimes. Many analysts have begun writing about the gross external debt of the individual EU nations (data available at the ECB and various websites). Even as Spain and Italy ‘s economy have “stabilized” their respective external debt situations have deteriorated further into deficit. Of course over the last six years the German external debt has grown further into positive balance. Germany is running current account surpluses, as well as a balanced budget if not a surplus, making the call to be short BUNDS more difficult. The only way the BUNDS fall dramatically is if GERMANY CAPITULATES AND ACCEDES TO DEMANDS TO BE PERPETUAL TRANSFER AGENTS FOR THE REST OF EUROPE’S DEBTORS. ***A point of interest: Even as the FED talks hawkish and the U.S. equity markets are close to record highs, the U.S. dollar is lower on the year. Also, GOLD has also rallied 4% since December 31, into the jaws of FED squawking about raising rates to counter an aggressive fiscal stimulus promoted by Trump and a Republican Congress. This is just a reference to the importance of 2+2=5 in the realm of Notes From Underground. Beware of subtle changes in market sentiment for being caught off-guard will cause severe indigestion. This entry was posted on January 22, 2017 at 8:36 pm and is filed under Debt Market, Europe, Germany. You can follow any responses to this entry through the RSS 2.0 feed. You can leave a response, or trackback from your own site. The question asked periodically in this blog and elsewhere has been, “But who guarantees the ECB?” “Whatever it takes” works as long as you have a central bank with all its members intact. The dike of a united EU had a leak with Brexit in June. November 8 showed another similar sentiment of the “forgotten man” who couldn’t afford the $52,000 Davos ticket, the Tammany Hall cigar- smoked room where the financial bosses made their plans for the coming year. But with several crucial elections coming up in 2017, has the die been cast? Has crossing the Italian river, the Rubicon, about to occur? Have the Roman senators having left Davos see Julius Caesar with his mighty army of disgruntled savers and plebes coming their way? Who will guarantee the ECB? While Trump meets this week w/Mexico, Canada, GB leaders – keep an eye on gold due to Nafta, TPP, etc. YRA has been right on with his gold comments. Richard D.
I have little doubt that the printing press will be used as never before in fits of desperation, to keep the house upright. The Weimar Republic tried this as well and we know how that ended. That is why the smart money has been accumulating physical gold and silver, the currencies par excellence. Paper gold will prove to be backed by little except what their sponsors hoped would carry them through normal periods. When the demand for the underlying asset will not be met, contract obligations will be met with cash, by then an unsatisfactory response to the unsuspecting investor. Hasn’t Germany already agreed? It seems to be the case of no means yes. I guess Europe blows up if LePenn is elected, or maybe that’s the next fake news…..
Oh, today I’m hearing BreXit is/near cancelled.